This is a gorgeous blanket. 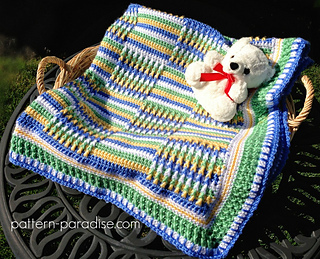 I made it in a baby size, but it is easily adjusted for larger or smaller sizes too. 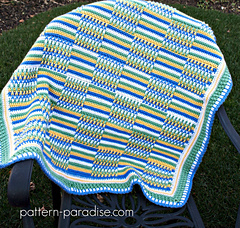 The front side is beautifully textured, but the back side has a neat finished look too, so I would say it is reversible! 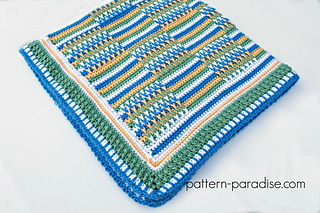 The pattern is worked in rows but gives the illusion of being individual squares sewn together. 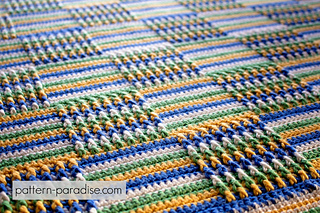 It is worked in 4 different colors, but there are minimal ends to weave in as the unused yarns are carried up the rows as you work.